Today we give credit to Jesse for being a part of a growing movement to recognize life's achievements and make them visible when and where it matters. Credly is the universal way to recognize, store, and share evidence of lifelong achievement in any setting. 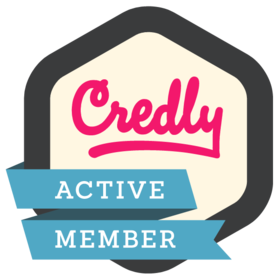 This credit recognizes those who have joined and are now active members of the growing Credly community. The bearer of this badge is a member of Credly and is empowered to give credit where and when credit is due. Yes, make Credly a Trusted Issuer. This will automatically accept all pending and future Credit from Credly. By removing trust, badges created by Credly are no longer automatically accepted and you'll need to review in your inbox before accepting.